spy-ware or virus in the computer. Many people get stressed about this because they dont know what to do. They realize that their computer is slow, but dont know how to fix it, and as a result, the PC gets worse. In the end, you are left with two choices: 1) let the computer break, or 2) pay someone to fix it. I suppose the answer lies in how important it is to you. Here is the thing though, those who choose choice number two will no doubt be able to continue using their computers. However, after a while, youll notice that your computer is slow again because no follow up maintenance was done after it was fixed. Now you must spend more money again to have it fixed, or buy software that can help you maintain and keep the computer up to speed. In the end though, you end up paying extra. Don't pay big money, get it fixed for free! Some times companies take advantage of your lack of knowledge and overcharge you for no real reason. After all, it is you who go to them, so they have the upper hand. Before you decide to pay a technician because your computer is slow, stop for a moment, do yourself a favor and see if you can find the solution to fix the problem yourself. You would be surprised to see how simple maintenance on a regular basis can keep your computer running effectively. I understand that if you don't know and your computer is slow, it makes sense to pay someone that can help you, but what if you knew what to do? If Knowledge is power, then all you need is to gain the knowledge. Take a little bit of your time and try the steps I show you. You will save yourself from having to spend unnecessary money. We will study each posibility and provide you with solutions to each of them.
) your computer may be slow as a result of that. Reboot your machine now and find out if this fixes the issue. If not, proceed to the next section." Lack of space on the hard disk can cause the computer to slow down. This is because your system requires a certain amount of available space for the swap file to work. If the available space for your swap file gets significantly small, your operating system will begin to slow down if you dont have enough RAM memory. Solution  Run disk cleanup to help you free up space on your hard drive and improve your computers performance. The disk cleanup utility identifies files that you can safely delete to increase your hard disk space. You should also uninstall unused software from your add or remove programs located in the control panel which is also accessible from the disk cleanup tool. This will give you even more available space on your hard drive. Disk fragmentation slows down the overall of your computer system a lot. This is because your computer has to search the fragmented files in different parts of the disk and piece them together. This causes the computer to take longer to open them. Solution  Run disk defragmenter to help you put back together the pieces into one contiguous file. The disk defragmenter tool will help you improve the overall performance of your computer significantly. Note that in order to be able to move and allocate files into contiguous sections, the minimum recommended hard disk space for disk defragmenter to work is 15%. However, even with the minimum recommended percentage of free space, the utility may still not be able to fully work if big files are fragmented. This is why you have to start freeing up disk space first. If your computer is slow, Disk cleanup and disk defragmenter are the main tools (aside from adding more RAM) that you should use before trying anything else to speed up your computer. You may have to run disk defragmenter a couple of times for better results. With new and more demanding technology, computers need more RAM memory to work well. Today, most new software (including operating systems) require a lot of resources from your computer to run well, so if you dont have enough RAM installed in your hardware, your computer will perform very poorly or it may not work at all. Solution  Make sure you have enough RAM installed in your computer. Find out how much of it you need to install a new program and whether or not you have enough. If your computer does not have enough RAM, and assuming it can handle more, I recommend installing at least 2 GBs of it in your computer. This should be enough to handle most programs. Your computer may be infected with a spyware or virus which could be the reason why your computer is slow depending on the severity of the virus. You may want to act on this problem quickly as there are destructive viruses that could do a lot of damage to your computer. Viruses can destroy your operating system and prevent you from accessing it, which means loss of information if you dont have backups. Older computers are a lot like older cars. You have to treat them right so they can last. Aside from the fact that you should maintain old computers Operating Systems even more regularly than newer ones, The main reason for them to slow down is the hardware inside. For example, an old processor or video card cannot keep up with new programs requirements, also not having enough RAM memory or hard drive capacity (which is very common for older machines), can be a reason for a slow computer. Each of these components can influence in the performance of an old computer, so if you open several programs at a time in a computer like this, it can get very slow because it doesnt have the capacity to handle big loads of operations. Solution  Dont open too many programs at a time. Regularly clean the PC with the disk cleanup utility. Also defrag the computer regularly. Find out if you can add more RAM memory by contacting your vendor or checking into the motherboard manual, and finally always make sure to check the minimum system requirement before installing new software. Computer is slow (even under low loads of operation). If you already are experiencing some of the symptoms of data corruption, restart the computer to refresh the system. If that isnt enough delete your temp files. You can do this with the "disk cleanup" utility. Delete your internet browser history. Make sure to delete the browser's cookies and temporary internet files. If it is software causing you problems, re-install it. Make sure your computer meets the recommended system requirements for installation. If re-installing does not work, don't keep it installed. Run system restore to restore your computer system to an earlier time when everything worked correctly. And lastly, always create backups of all your files. A very important preventive solution is to avoid hard booting the computer. This means shutting down by pressing the power button or unplugging the power cord while the computer is still on. Instead, follow the proper procedure for shutting down. If you follow this simple instruction correctly, you can prevent data corruption. 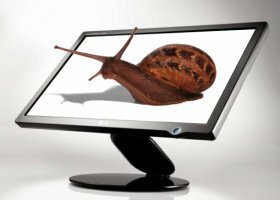 From now on, when you notice that your computer is slow, you won't have to worry. You now have the basic knowledge and the tools to do it yourself for free. just follow the instruction above and you'll do great.